Sushi Tetsu is one of those rare places that reminds you why you go out to eat. This welcoming seven seater in Clerkenwell, run by an amiable husband and wife team, serves unpretentious, high quality sushi and sashimi to an appreciative audience. As you step behind the noren, hiding prying eyes from the street, you emerge into a cosy bar much like what you would find on the back streets of Japan. When I visited, the atmosphere was buzzing with happy punters, with the bubbles of conversation occasionally popping to be replaced with a soft groan of happiness or an appreciative nod to the chef, acknowledging a wonderful shared experience. It's the best sushi experience you'll find in London. The downside to this nirvana, of course, is that reservations are hard to come by. 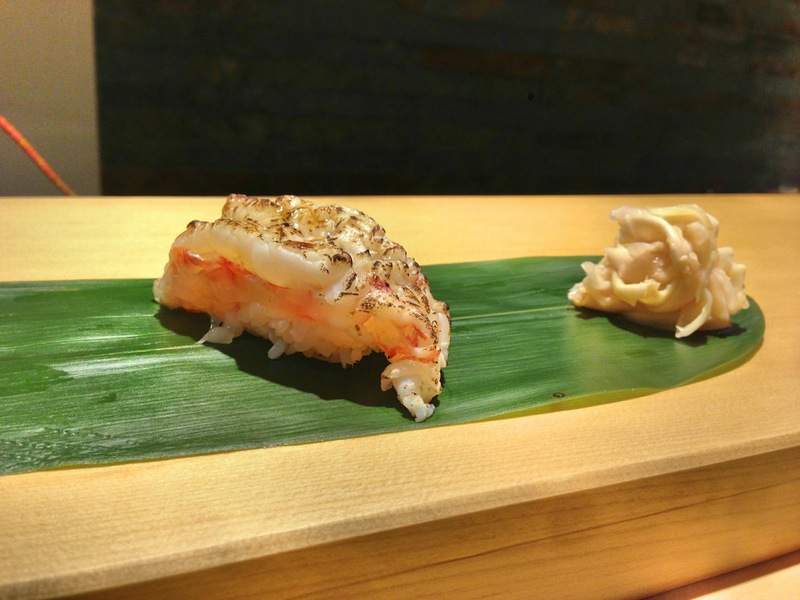 Sushi Tetsu has recently changed its reservation policy and now takes bookings one month in advance on the first of the month. With only seven seats and a limited number of sittings, the demand is understandably high. There seems to be an inordinate number of cancellations though, so if you are flexible, keep an eye on the official Twitter account for updates of late cancellations. They too go quickly though. I got lucky and was invited to eat by an avid Sushi Tetsu fan for dinner one evening. Still riding high on the giddy enjoyment of my recent trip to Tokyo, there was no chance I would pass up the offer. 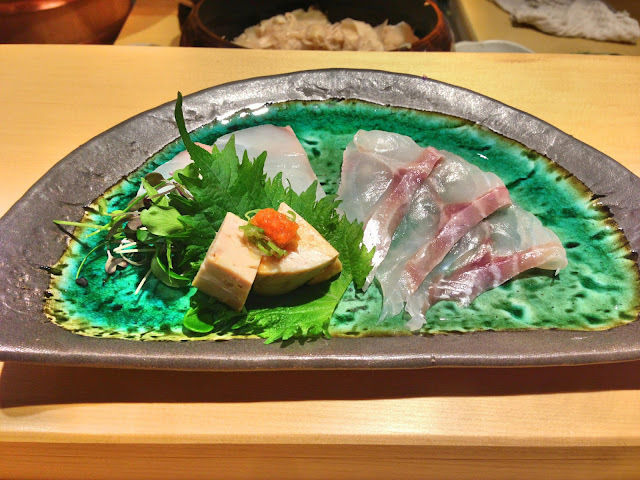 When seated, chef Toru asked how hungry we were and whether there was anything we didn't like to eat. Answering (as I typically do) "very" and "I'll eat anything", we left the meal in his expert hands. We began with a selection of sashimi - sea bass and yellowtail served with a ponzu based dipping sauce. The dish also came with small cubes of monkfish liver whose richness countered the lightness of the sashimi. I loved the fresh fragrant shiso leaf salad too. An enormous steamed whelk followed. Toru-san boils the whelk and then mixes it with mirin and some other ingredients before lightly steaming it again just before serving. A savoury topping of spring onion and a shake of sansho pepper add warmth and freshness to the flesh. We ate this with a toothpick, digging out the meat which curled tightly into the shell. The slightly chewy texture might not be for everyone but this tasted of the sea, lightened with the sweetness of the mirin. I couldn't help but take a slurp of the remaining juices from the shell either. 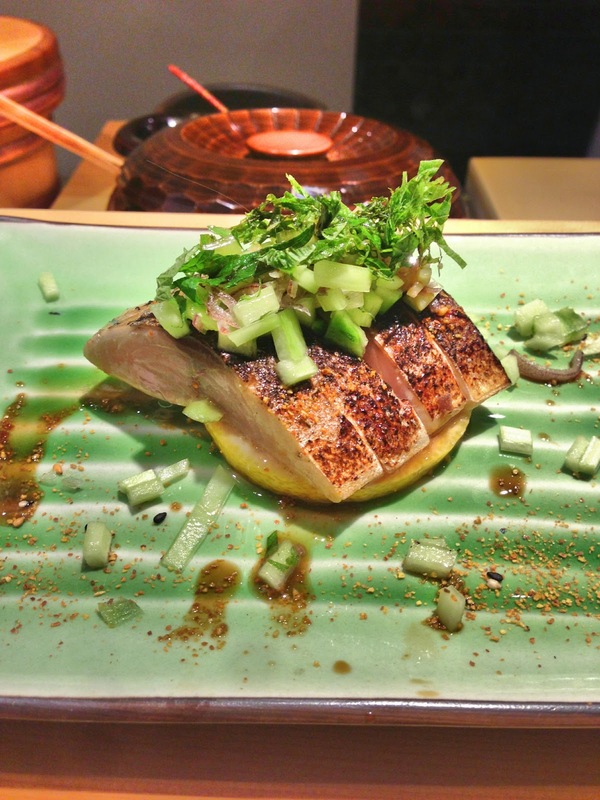 A beautiful piece of flame grilled mackerel followed. The chef flamed a whole tranche for the three of us before splitting it into portions. This was incredibly tender and just about the best mackerel I've eaten. A small salad of cucumber and shredded shiso topped the fish, while a generous sprinkling of sansho pepper added some warmth (Toru-san seems to love sansho as it crops up time and again, which suits me just fine). Bite-sized nigiri mouthfuls followed. A jumbo shrimp was neatly burnished to impart a light smokiness to the sweetness of the slightly crunchy flesh - a lovely contrast. Bream marinated in seaweed was another tender morsel before the first tuna dish. The medium fatty tuna (pic at the top) was an amazing bite, with the fish seemingly dissolving on the tongue. It stopped me dead in my flavour tracks. An interesting combination of summer squid and sea urchin came next. You can see the orange urchin under the thinly cut squid. The slightly crunchy squid contrasted nicely to the creamy urchin. The snow crab was another incredible freshly sweet bite, but it was at this stage that I started to notice the rice. There was the warmth and the seasoning, but most of all I was impressed by the integrity of each grain. Maybe it was the plum wine, but I became more aware of the rice as a unique component in each dish instead of just the vessel on which to carry the fish. I guess I'm just more used to the mass produced sushi rice, which is squashed together by machine or by hand. 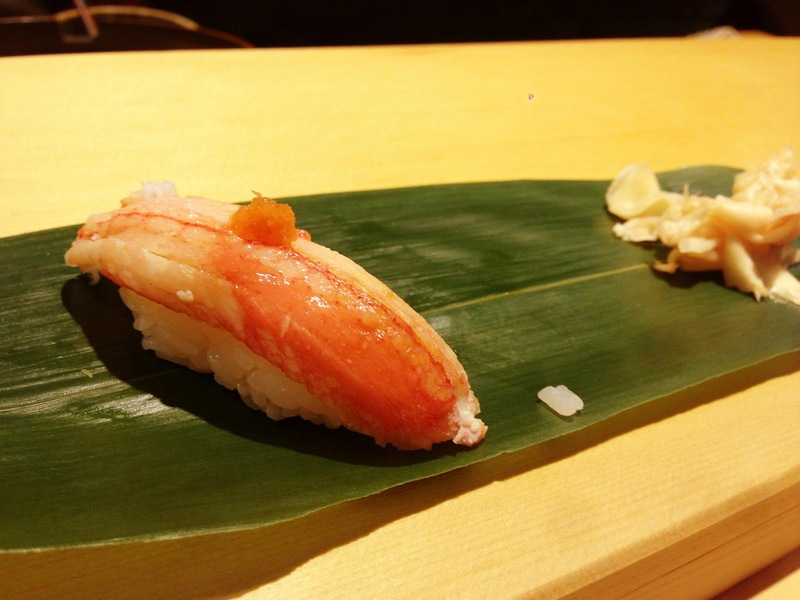 At Sushi Tetsu, each "shari" - the rice base - is carefully caressed into shape so that it just holds together long enough to get from the banana leaf plate to your mouth. It's easy to take this skill for granted, but it adds so much to enjoyment of each mouthful. 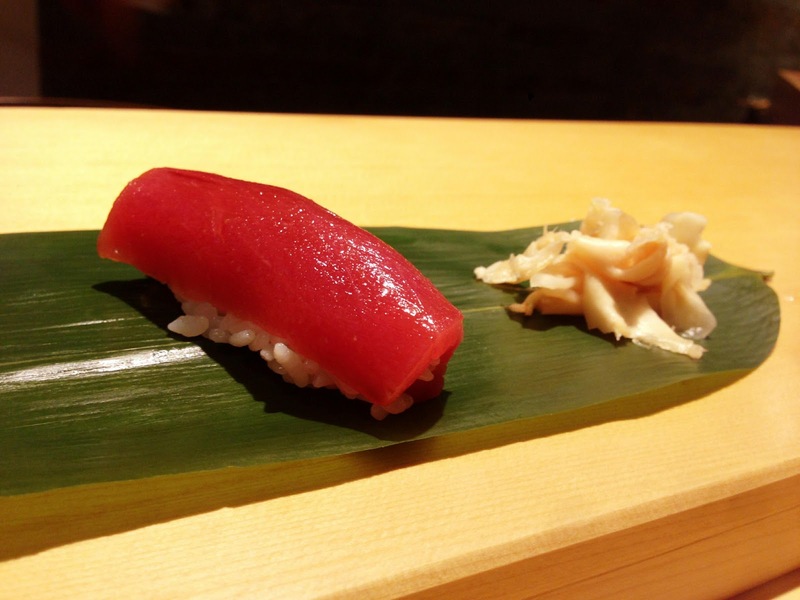 Back to the sushi, and the beautiful glistening akami tuna was another revelation. Such a beautiful colour with clean fresh flavours. Salmon eggs followed and were treated to a little citrus dusting. The cool eggs contrasted nicely to the residual warmth of the rice. The odd sensation and texture of the eggs popping in your mouth never fails to make me grin. I don't think I've ever eaten proper fatty tuna before, or at least it didn't leave the impression that this mouthful did. Here, the tuna is scorched to bring out the flavours, which verge on the meaty. As Toru-san flames the tuna, the small room fills with the aroma of barbecued fat and it's impossible not to salivate. I wiped away a little fatty smear from my lips and smiled inwardly. Everyone should order this. By this stage, we were getting pretty full, but there was room for just a few more courses. Another piece of mackerel was served, but this time draped with a wafer thin slice of seaweed, which gave the bite a bit of crunch. 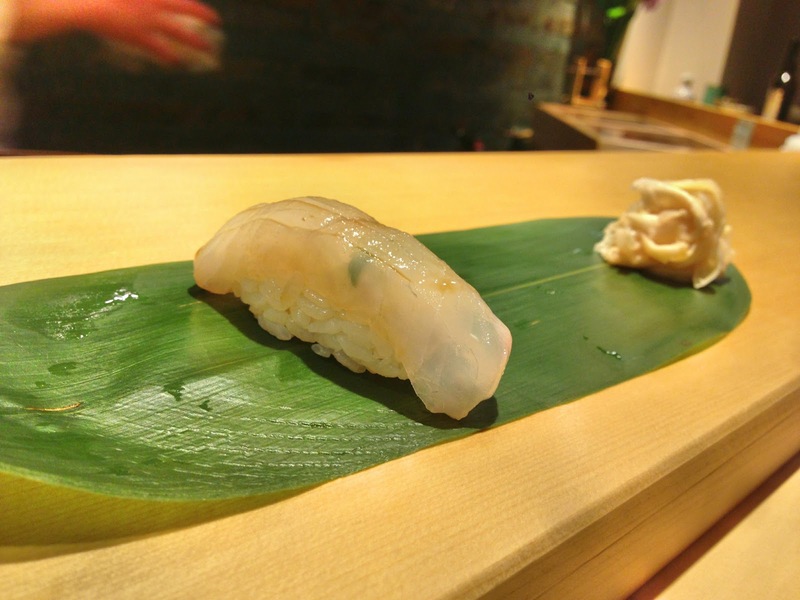 If there is a signature dish at Sushi Tetsu, it is probably the temaki. Different cuts of tuna are coarsely minced and then smeared across the rice coated sheet of nori. The nori itself has been toasted to give it a deeper flavour and some added texture. Some crunchy pickles are added, while heat comes from freshly grated wasabi root and, just for good measure, there is a liberal sprinkling of sansho pepper, before it is rolled into the familiar shape. Each bite is a delight. We finished with tamago, but the flavour was somewhat elusive as I expected a sweeter ending. After a guessing game with Toru-san, he divulged that it is flavoured with shrimp and sea bream. Actually, I was surprised at how patient he was during the evening with questions from myself and other diners about how he prepares certain dishes or where he sources his ingredients from. This relaxed vibe contributes to the family-style dining experience. If only my family dinners had been like this though! All of this is, however, not particularly inexpensive considering it is simple, pure food without gimmicky culinary wizardry. The extensive omakase menu is £70, although there is a more affordable £50 option and various sashimi and sushi sets which come in at a lower price point. But, no two meals are likely to be the same at Sushi Tetsu given the reliance on seasonal produce, which makes it a place I would happily visit again. I paid £100 all up for 14 courses, plus a couple of glasses of plum wine and a lovely floral sake (Nanbu bijin). That might sound like a lot, but I'd certainly prefer to pay that much for an outstanding meal at Sushi Tetsu than the same amount for a hit and miss affair at somewhere like Hedone, for example (in my experience). So my advice is to start dialling on the first of the month or keep an eye on Twitter or, even better, get to know someone who by luck would have it happens to have a spare seat going and might just invite you along again sometime.